Boxing legend Evander Holyfield sparked a furious response on Saturday after a series of inflammatory comments on a British reality television show in which he likened homosexuality to a "handicap" and claimed being gay could "be fixed." 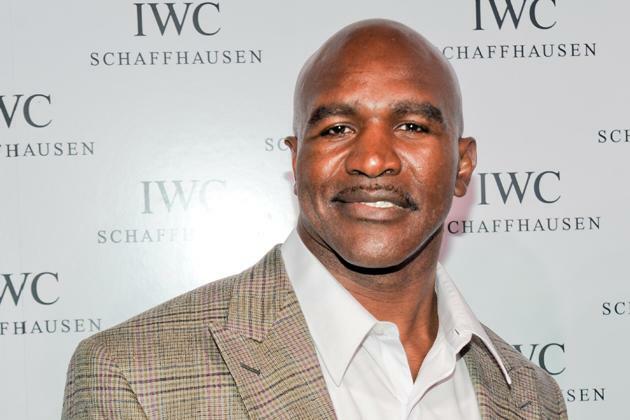 Holyfield is a current contestant on "Celebrity Big Brother" in the United Kingdom and made the remarks in a conversation with fellow housemate Luisa Zissman. As part of a twist in the show's format, Holyfield and Zissman were handcuffed together at the time. After Zissman expressed hope that more gay professional athletes would come out, Holyfield pulled no punches on the topic. "What would be good about it?" said the four-time world heavyweight champion, according to multiple reports. "That ain't normal." While Zissman apparently tried to end the conversation, Holyfield was just getting into full flow, according to the following excerpt from the Daily Mail newspaper. Holyfield: The bible lets you know, that's wrong, that's right. Zissman: That's just the way some people are. Holyfield: No, it don't make no difference. If you were born and your leg were turned this way, what do you do, you go to the doctor and get it fixed back right. Zissman: It's not about being fixed, it's about… that's just the way that you are. Zissman: I really don't want to have this conversation. Zissman: You don't understand, I don't think it's an appropriate conversation to have in this house, honestly. Zissman: You can't compare, of course you can't compare someone that's gay to someone that's handicapped, it's not a choice. Zissman: I'm tired. I don't think people have a choice in their sexuality, or they would be unhappy. The 51-year-old Holyfield was swiftly summoned to the show's "diary room" by program directors and informed that his comments had been deemed inappropriate. However, he was allowed to continue participating in the show. Meanwhile, social media quickly responded with varying degrees of outrage. Openly gay Culture Club singer Boy George, real name George O'Dowd, expressed his disappointment at Holyfield's stance with a statement on Twitter. One of the saddest aspects of Holyfield's rant was his ignorance of gay boxer Orlando Cruz. Holyfield told Zissman that to date no boxer had come out of the closet, but Cruz did in 2012 and has been a fine ambassador for both his sport and the gay community, earning a WBO featherweight world title shot in October before losing to Orlando Salido in seven rounds. Holyfield has been married three times, has fathered 11 children and in 2012 was forced to sell some of his most precious items of memorabilia to pay for extensive debts. Those money troubles are seen as the main reason why he extended his boxing career until the age of 48 and he has also chased extra paychecks by participating in television projects such as "Dancing With The Stars" and "Big Brother." He would be well advised, however, to keep his more controversial opinions under wraps in the future or risk the fondness with which he is remembered.